Zili the Belgian Malinois who helped capture terrorist who murdered Ori Ansbacher. Zili and Sgt. Maj. A. The dogs serving in the Yamam police special forces unit work with its forces to locate and arrest terrorists. 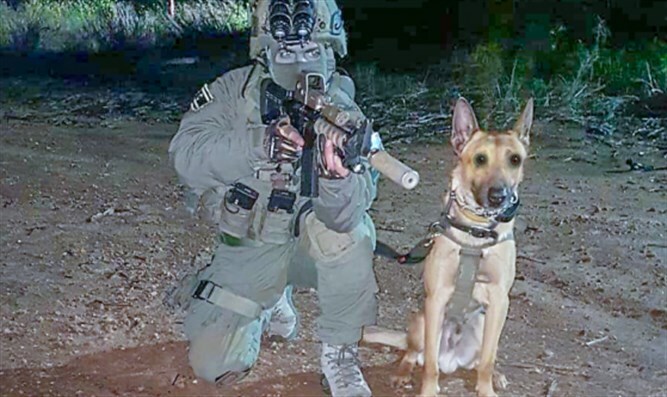 Zili is a six-and-a-half-year-old Belgian Malinois who helped with the capture of the terrorist who murdered 19-year-old Ori Ansbacher. Zili has served for five years with the Yamam team participating in dozens of complex operations to thwart terror and to locate terrorists. Sergeant Major A., the officer operating Zili in the last operation told Maariv newspaper that, “During the night hours, we arrived at a building in Ramallah. We began to comb the building and on one of the floors I released Zili to search. I heard barking and understood that Zili had apparently located the terrorist. Zili subdued him so he wouldn't run away and when we got to him, we arrested him. “This isn't the first terrorist Zili successfully located and as the dog handler in the unit I know there's no greater pride than your dog succeeding in capturing a terrorist,” said Major A.